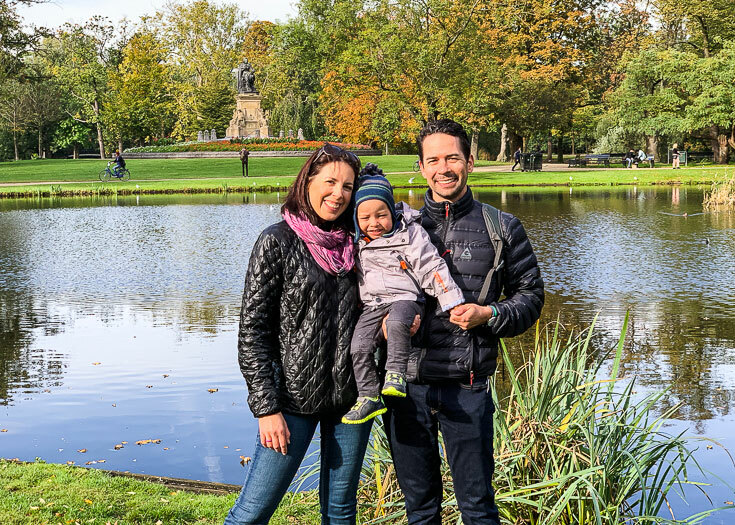 Family and toddler-friendly guide to visiting one of the most beautiful cities in Europe over three days. Amsterdam is one of the most beautiful cities in all of Europe, if not the world. The brick buildings along endless canals to walk along, tulips to gaze at and culturally diverse friendly people to converse with. It also happens to be the most friendly American expat city in Europe. 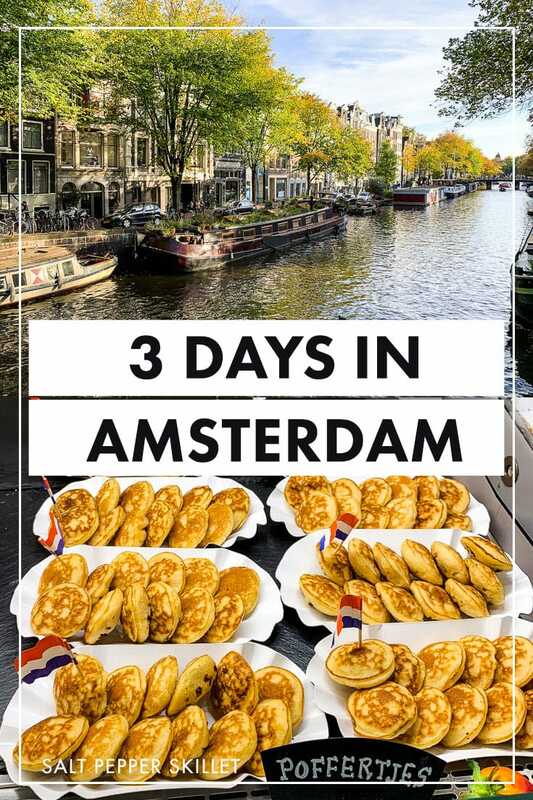 Three days in Amsterdam is the perfect amount of time to take in the scenes and experience the culture of what the beautiful city has to offer. Our visit was in between London and our next stop, which would be Italy. All family and toddler friendly. Take a bike tour to see the city while learning the history. Visit the world-class museums and galleries. There are countless museums that are home some of the most important art in the world lives in Amsterdam. From Van Gogh to Rembrandt, you will find you will find it here. Rent a bike and cruise the city. Stroll through the sprawling Vondelpark. Take in the sights of the tulips when they are in bloom. Get out of the Dam center and explore the diverse neighborhoods. Jordaan was one of our favorites, and it’s home of the Anne Frank House. Take the kids to a city playground to play with the local kids. We lucked out with some fantastic food. Here’s where we ate. La Perla Pizzeria in the Jordaan neighborhood has delicious wood-fired pizza. Zaza’s A French restaurant we went on for our date night. The light and fluffy Turkish bread they serve is to die for along with all the other dishes we tried. Grandcafe l’Opera in Rembrandt square. This is a touristy restaurant but in a good way. Sit outside to people watch. The burger and frites were excellent. Ice Bakery. 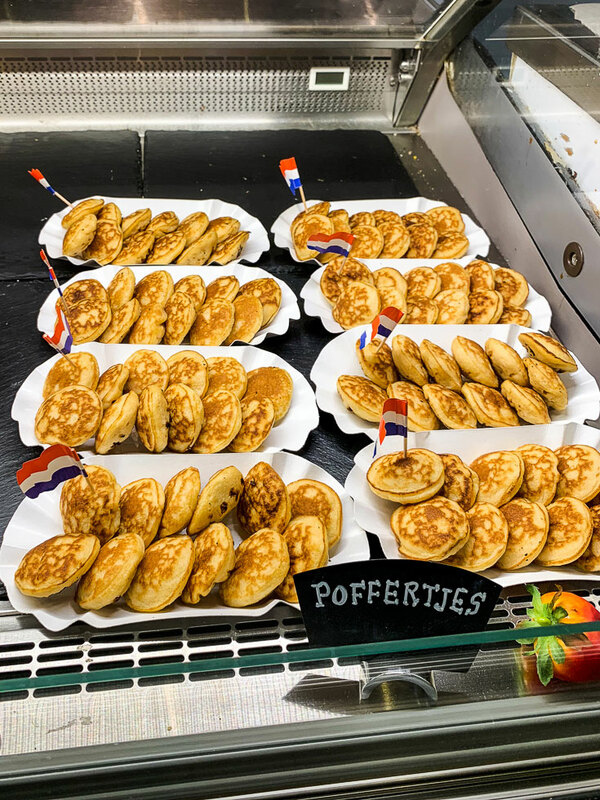 A bit overpriced, but the Pofferties (traditional Dutch pancakes) with your favorite topping and fruit were totally worth it. Warung Padi Indonesian take away restaurant that we got on our way back to the hotel. It’s definitely not near the city center, but worth stopping at if you are in the area. Albert Heijn Grocery stores (located throughout the city) was the place we would stock up on snacks and take away foods to warm up in the hotel room. Amsterdam isn’t really known as a food city and Amsterdam/Dutch food leaves something to be desired. That doesn’t mean that there isn’t amazing food to be had. 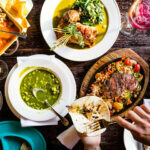 In fact, we surprised some people with how much great food we were able to discover. Stroopwafels. The sweet treat of two thin waffles put together with a sweet syrup in the middle. Crunchy and gooey, they are highly addictive so stock up and bring them home for your friends. Frites. The Dutch version of fries thick cut and so crunchy with a wonderful fluffy inside. Indonesian and other Asian inspired cuisines. Pofferties. Small and fluffy dutch pancakes topped with Nutella. Cheese, please! The Netherlands has some of the most delicious cheese anywhere. Start with A-Bike Tours. 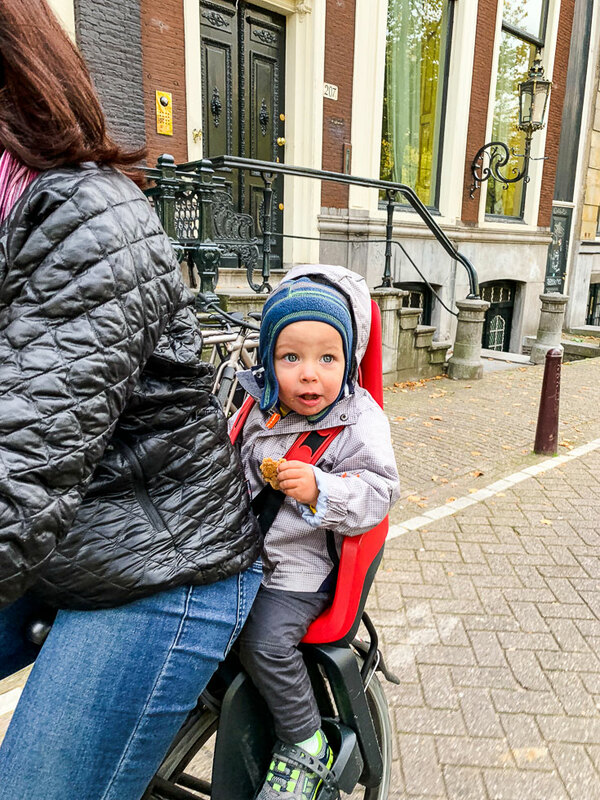 Benjamin loves the bike at home so finding a bike tour that has child seats. Bike tours are our favorite thing to do when first arriving in a new city. It gives us the lay of the land, history, and helps us decided just what we would like to explore more of. Head to the grocery store to pick up supplies. Albert Heijn is throughout the city and one of the coolest grocery stores around. Everything is incredibly fresh. Even better they had a ready-made pasta that Benjamin just loved. This was a big win for us! Rent a boat to cruise the canals on your own. In general, we just love boats and the water…so today is going to be a boating day. If your not up for renting or hiring your own captain for a boat you can always take the canal tour that is included in the Iamsterdam Card. Maritime Museum. Who doesn’t love exploring an old ship? Pretending you are the Captain…giving orders..sailing off into the seas. Houseboat Museum. 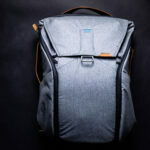 Included with the Iamsterdam card. We probably would have skipped this if we had to pay for it separately, but really enjoyed this quick stop to see how a family lived the Dutch way of life on houseboat in the 1960’s. Check out another museum on your list. With Amsterdam having such great museums be sure you make it to your top two or three before heading home. Picnic lunch and light walk in Vondelpark. Albert Heijn again is a great place to get deli meats and cheeses for the picnic lunch. Don’t forget that beverage of choice. Shopping. Check out the local markets and pick up a souvenir for that special someone or better yet, you! You can always go with something in everyday use like a dish towel to be reminded of the fun you had in Amsterdam all while drying off that plate. Head to a Brouwerij ‘t IJ for a beer flight and a meat & cheese plate. Great place to enjoy some tastings and or take a tour. It is right next to the De Gooyer windmill and has a great ourdoor terraced deck. 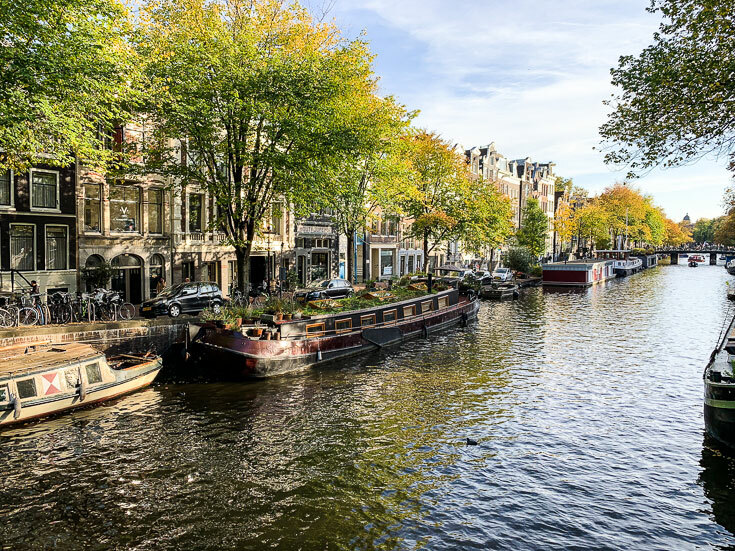 The Iamsterdam City Card is an access card that gets you access to 60 museums and attractions, a free canal cruise, access to attractions outside the city and discounts at restaurants and activities. One of the things we loved about the city card is you will visit museums and take part in activities that you hadn’t planned on because they are included with the card. It’s a great value at €85 for a 72 hour card (other options available). This gets you all the public transportation within the city that you could use, which is a huge benefit on its own. Learn more about the Iamsterdam City Card. Staying in the city center is convenient, but really isn’t essential. We stayed at the XO Hotels Couture which is 3 miles from the city center and it was a quick 20-minute tram ride in. The hotels outside the city center are often more modern and definitely less expensive. just be sure you are close to a tram stop if outside the city center. You just have to weigh the pluses and minuses for which works best for you. City center hotels can be quite expensive with often very small rooms, but there is something wonderful about looking out your window onto a beautiful canal. With the small size of the Amsterdam City (though it might not appear that way on the map), walking and biking is the best way around. The tram is a great way to get to the city center from the outskirts, or from one side of the city to the other. Hourly and daily tram tickets can be purchesed, and access to the tram comes with an active Iamsterdam card. Schiphol Airport is quite close to the city center. Take the express train from the airport to Amsterdam Central Station, which takes about 10 minutes. The summer months of July and August are the busiest time to visit Amsterdam with the best weather. The tulip season is in the Spring from April through early May. The best deals on flights and hotels can be found in October through March, when the weather is less desireable but still beautiful. 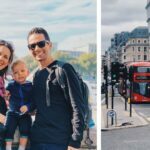 Family-friendly guide to traveling to the beautiful city of London.